Growing gourds inside cup-shaped moulds creates a biodegradable alternative to plastic containers. A New York company’s plan to grow cups out of watertight, decomposable gourds (a type of pumpkin) is being touted as an environmentally-friendly replacement for the 2.5 billioncoffee cups that are currently thrown away in the UK each year. Almost none of these current coffee cups can be recycled, because of the plastic and paper mix they use to stop them leaking. Many of us like to start our days with a steaming cup of joe. So it’s unsurprising that coffee houses, from independent hipster joints to giant chain stores, have been setting up shop at at a rapid rate: there are currently 22,000 of them in the UK, more than twice as many as there were a decade ago. But people are now getting concerned about the environmental cost of all those cups. Making them contributes to climate change. And they are expensive to dispose of properly and toxic to wildlife when discarded irresponsibly. So last October Philip Hammond, the Chancellor of the Exchequer, said he’s going to put a 25p tax on disposable coffee cups. 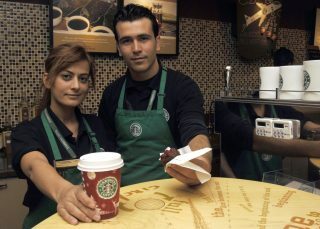 The extra cost is intended to encourage coffee-lovers and coffee-sellers to look for alternatives. Hence the interest in gourds. Read our explainer on: the environment.